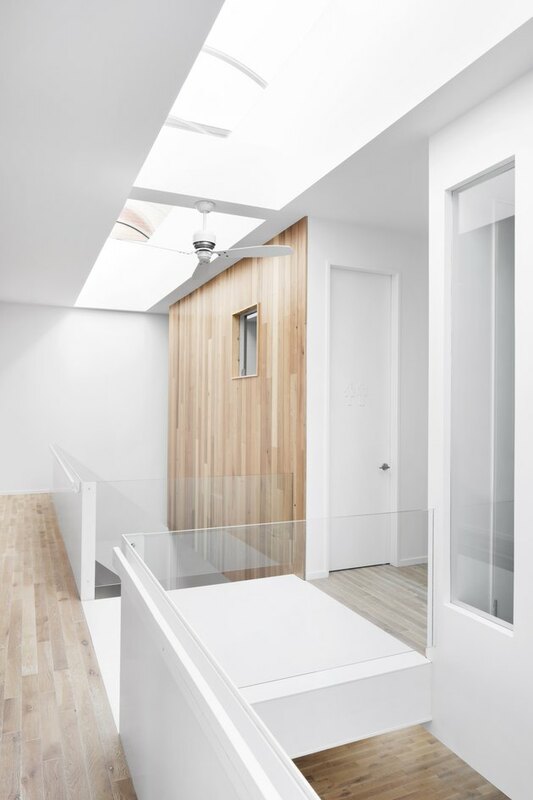 It's common for most clients seeking to renovate century-old homes to request that their architects find a way to bring in more natural light. But it isn't so common for a client to also be a general contractor. 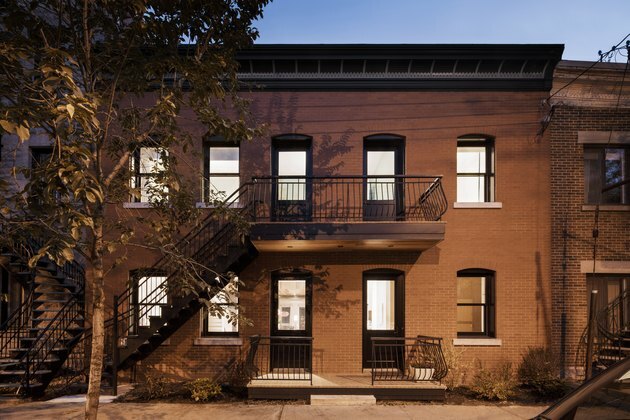 That's what principal Maria Di Lioa of EM Architecture found when she agreed to work with a more knowledgeable homeowner on how exactly to upgrade a longstanding Montreal duplex. For starters, the property had been split into four small apartments, so Di Lioa's initial task was to remove a maze of walls and outline a two-story extension. And while the plan for an open layout would undoubtedly illuminate the structure, Di Lioa decided to go a step further. 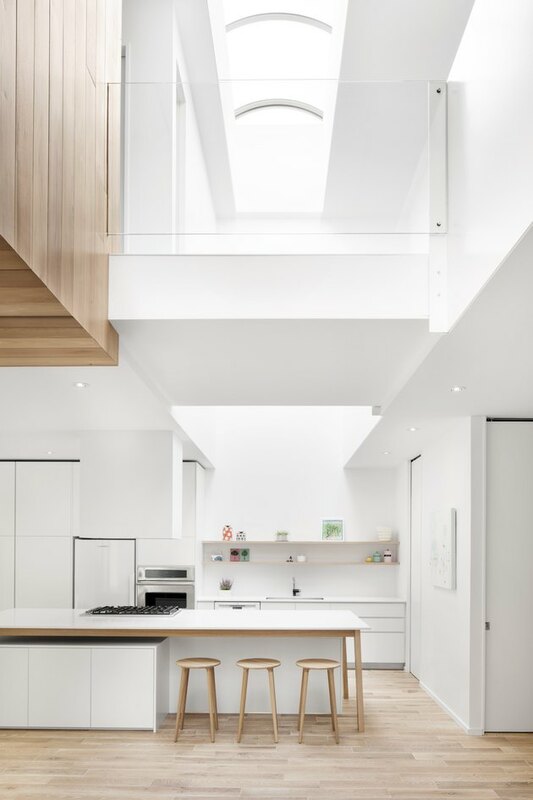 She installed a skylight that spans the entire width of the house, and outfitted its spaces with white walls and natural wood. Now the contractor with plenty of experience also has plenty of natural light. The property's original charm was retained primarily in its facade. Di Loia and her team "restored its original character with new brickwork, balconies, and cornice," she said. 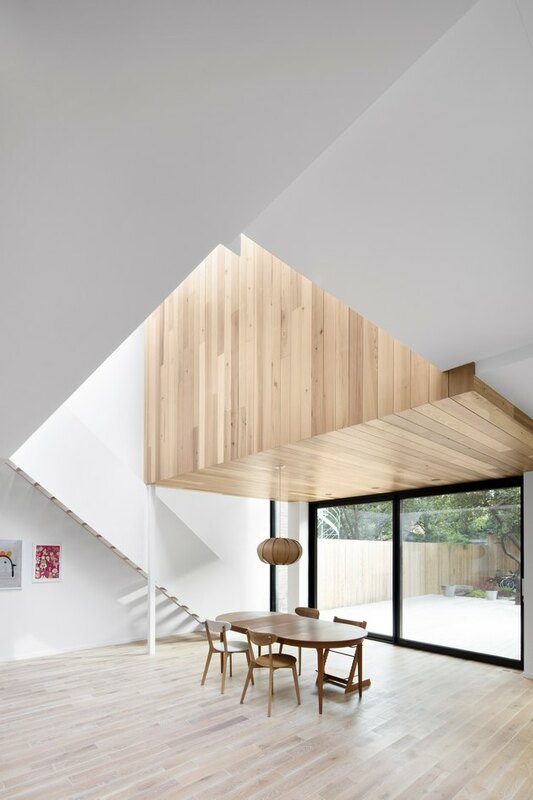 White oak by Unik Parquet was used throughout the home — even on the dining room's ceiling — to create a unifying look throughout the open floor plan. Ample windows aid in the goal for more natural light. 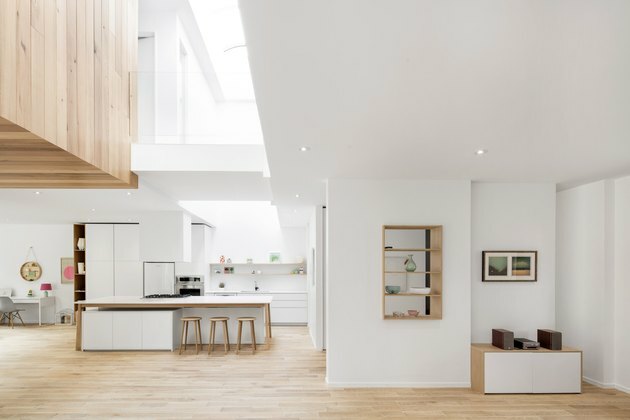 "We decided to integrate a large opening in the middle of the house with a linear skylight to bring in as much natural light as possible," Di Lioa said. Glass railings on the upstairs walkway let even more of it filter into the kitchen. Unik Parquet's white oak covers the majority of the home, from the floor to the ceiling. Fabelta windows and sliding doors were used throughout the property. They were an essential part of achieving the bright, airy atmosphere that "connects with the exterior," Di Lioa said. 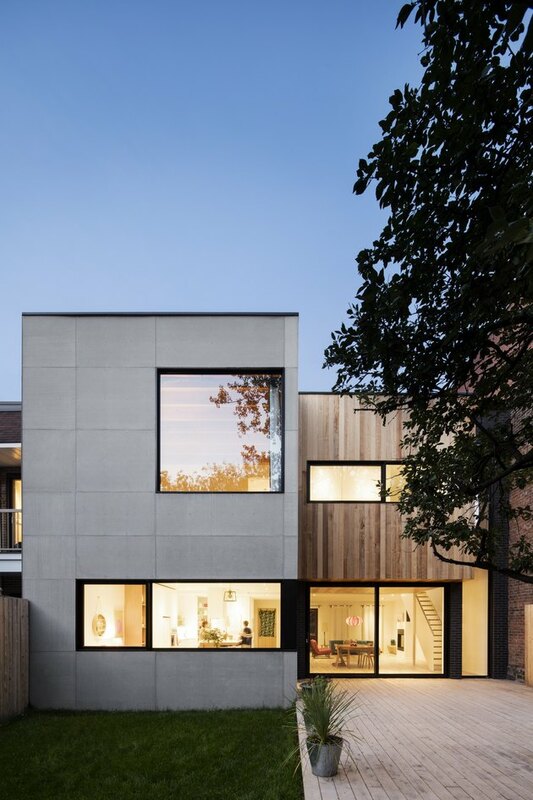 A glass-paneled walkway connects four upstairs bedrooms. White paint is the obvious choice for showcasing a home's natural light. In this case, Benjamin Moore's "Oxford White" was used throughout the property. 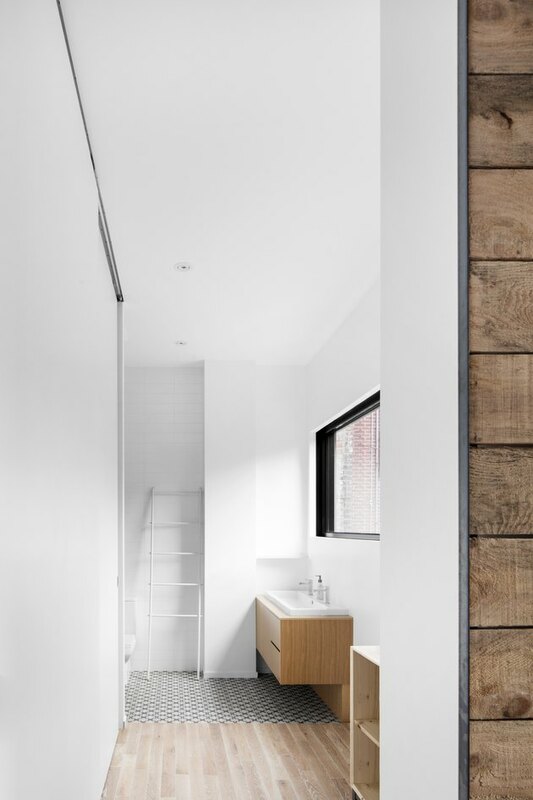 Although natural light was the priority, it wasn't the design's sole focus — natural materials were, too. Cedar was used in the ceiling above this bedroom. 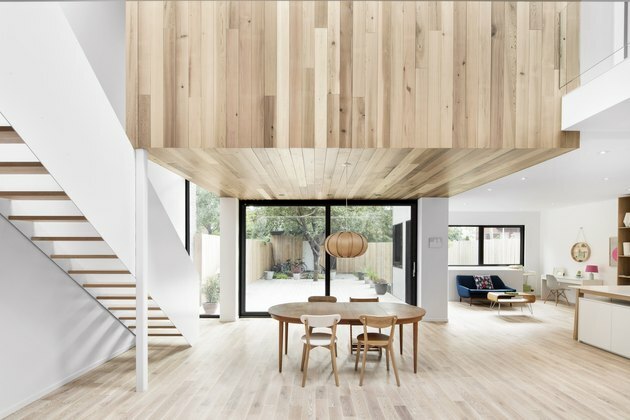 A two-story extension was added to the back of the home to create even more space and natural light.